A new type of atmospheric science mission to Mars (MetNet), initiated and defined by he Finnish Meteorological Institute (FMI), is being put together by the consortium including the FMI, Lavochkin Association (LA),the Russian Space Research Institute (IKI) and Instituto Nacional de Técnica Aeroespacial (INTA). 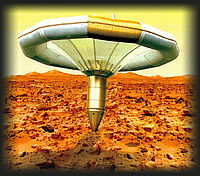 The MetNet mission to Mars is based on a new type of semi-hard landing vehicle called MetNet Lander (MNL). The scope of the MetNet Mission is eventually to deploy several tens of MNLs on the Martian surface. The MNL will carry a versatile science payload focused on the atmospheric science of Mars. The basic ideas of MetNet were cast by the FMI-team already in late 1980s. The concept was nurtured over a decade, and eventually the MetNet development work started in the year 2000. The first step in the MetNet Mission is to have a Mars MetNet Precursor Mission (MMPM) with a few MNLs deployed to Mars.